Press releases are an effective marketing tool that can be used to promote your new website, service or product. In this lesson, we’ll show you how to write, plan and submit a press release for maximum results. What is a Press Release and why should you use one? A press release is an official statement that is sent out to journalists, newspapers and bloggers to inform them of a new service, product or other news story to do your business. Essentially, a press release is a promotional tactic used to get the word out about something new in your business. In marketing terms, press releases are great for promoting a new product, service or part of your business (this might include new surveys, infographics and new website features). When you issue a press release, it’ll get sent out to 100s of targeted journalists and news sites with the hope that they’ll pick it up and run the story themselves. The main advantage for utilising press releases in SEO is that journalists and bloggers can pick up your story and write about it; this helps generate powerful brand citations and backlinks that help rank your site for SEO. Before you Issue a Press Release…Make sure it’s actually news worthy! The fact is, if your press release isn’t news worthy or interesting for journalists than it won’t get picked up. Period. That’s why it’s important when planning your press release that it has an interesting angle, engaging headline and great copy. It needs to engage journalists and readers from the offset if they’re to write about it later. As previously mentioned, the aim of a press release for SEO purposes is to get your story picked up and republished on authority sites and relevant media publications. For example, if you can get your site linked to by the likes of Mashable.com, TimesHigherEducation.co.uk or BBC News than that’s great for your SEO. Once you have a good store, the next step is to plan and write the copy for your press release. A boring headline can put off anyone from reading a good press release, which makes it the most important part. The headline is what captures the journalist or reader’s attention. It should be short (enough to fit into an email subject title, tweet or search engine results page), engaging and contain your most important keywords. Your headline should also be specific and include “what” has happened. Examples of good press release headlines include: “Survey Reveals Majority of Students Feel Ripped off by University”, “New Report Ranks Top US Cities for Bed Bug Infestations”, and “Facebook Passes more than 1 Billion Users”. The best types of headlines are those that are short, exciting and encourage the reader to read more. If your press release contains interesting or controversial statistics then aim to include this in the headline too. Obviously, the former headline sounds better. It’s shorter, gets to the point faster and includes interesting statistics. In order to help write a snappier headline, some copywriters recommend saving the headline until last. This can give you a clearer picture of the most important items in the press releases. Now that you’ve got the reader’s attention with your headline, you need to fill them in on the details in your body. The most important thing is to include the proverbial “Who”, “What”, “When” and “Where” as early as you can in the body. You need to get across a sense of urgency and action of what happened, whom it affects, why it’s important and when and how it came about. But, you need to write it in a short, engaging manner so that they get the message across as early as possible. The more the reader or journalist connects with the story, the more likely he’ll pick it up and cover it himself. The overall length of the press release body should be around 300-400 words. This includes details about what happened as well one or two quotes from an important stakeholder (this might include a CEO, Vice-President or industry expert). A great way of encouraging journalists to cite your brand or link back to your site is to include quotable experts and independent statistics in your press release. Journalists love to use new stats, especially when they’re controversial or go against the prevailing trend. Expert quotes (or even statements from people affected in the story) help bring your story to life and increase the emotional response of the reader. If you do include statistics in your press release, make sure you tease journalists by limiting the actual data and then provide a link to the full data (or visual charts) at the bottom of your press release to your website. This will encourage journalists to visit and link back to your site when writing your story. It’s imperative that you add contact details (email, phone number and spokesperson) to the end of your press release. This is so that interested parties and journalists can get in contact with you if they want more details on the story. For example, they may wan to conduct their own interview or grab some extra information or background for the story. Adding contact details also helps bring credibility to the story. Don’t be afraid to pickup the phone either. If you’re working for a client than encourage them to respond to the journalist’s request and get maximum results. Remember, just one pickup on a major news site can lead to hundreds of additional pickups and links from bloggers. Finally, Where to Submit your Press Release? Once you’ve finalized your press release, it’s time to target some news outlets to send it out to. 1) You can use a premium press release syndication service such as PRWeb or PRNewsWire, which sends your press release out to hundreds of news sites and generates 1,000s of page views. 2) You can engage in manual PR outreach. This process involves curating a list of targeted journalists and bloggers to send your press release to. You can learn more about this process here. The advantage of the first method is that it’s quick and has mass impact because it syndicates your press release to 100s of Google News approved sites. It’s also relatively cheap ($300-$400). The disadvantage of PR syndication services is that they’re not very targeted or personal. They can also be expensive if you’re turning out press releases every week. The advantage of the second method is that it allows you to build relationships with important journalists and reporters in your industry, generates better results and has a higher success rate (around 5-7% of targeted journalists will respond to your email). The disadvantage is that it’s resource intensive – it requires a lot of time curating outreach targets and emails. It also requires a certain level of expertise – that’s why many small businesses will usually hire a small PR or SEO agency to do this on their behalf. Infographics have become an increasingly popular form of marketing over the last few years. They can be used to build links, brand awareness and social shares. In this lesson, we’re going to explain how to use infographics to build links, manage your outreach and how to hire an infographic designer. Why Are Infographics Important for Link Building? As explained on this article on AdvancedWebRanking.com, infographics still provide a number of link building opportunities in SEO. All of the above can be used as part of your link building strategy. One of the greatest advantages of infographics is that they can be used to earn links in notoriously hard industries such as gaming and payday loans. By creating an infographic that can be promoted across a range of industries, you’ll be able to diversify the number and types of links to your site. For example, PocketWinnings.com is a mobile casino affiliate site that published an infographic on the growth of mobile gambling to a $100 billion industry. The infographic was subsequently republished shares on dozens of technology portals and news sites including CIOL.com, MGamingWatch.com, CasinoMeister.com and FierceMobileIT.com. The types of infographics that have the most success are generally those that are tailored to a very specific niche or subject (where you can do targeted outreach), help explain a topic or contain interesting news and data. For example, this infographic on the life of Steve Jobs (published shortly after his death) was picked up by Mashable.com and received more than 8,000 social shares. It also goes without saying that the success of an infographic will be aided by the design, readability and quality. Struggling for Ideas for your Infographic? If you’re struggling for ideas of what type of infographic will have the most success for your audience then I highly recommend using a tool called Buzzsumo.com. Buzzsumo.com allows you to search the web for different types of content (such as infographics) in different keywords/industries and see which ones performed best in terms of social shares. Ideally you should plan your promotion strategy and outreach targets before you begin the infographic design (especially if it’s time sensitive). Depending on your budget, you may wish to use a PR newswire service such as PRNewswire.com ($300) or PRWeb.org. The advantage of PRWeb.org is that you can include the infographic in the press release. If your infographic is on a particular topic, I recommend searching for sites that covered that topic recently in either Google or Twitter. You can use the advanced search function in Google to search for results from within the last 30 days. The reason I do this is because if a site has covered your topic recently than they’re more likely to be interested in publishing or linking to your infographic. Secondly, search Google or use Buzzsumo.com to search for previous infographics in your industry. This gives you a list of targets who previously published infographics on the topic and may be willing to publish yours. Simply search “keyword+infographic” in Google to find a list of targets. There are a couple of solutions to ordering an infographic designer. You can either use an infographic design agency, such as InfographicDesigner.co.uk, or you can hire a freelance infographic designer from a graphic workroom site such as Microlancer.com, Visua.ly or elance.com. The price of an infographic can vary depending on the quality and experience of the designer. Typically you should expect to pay around $400 – $1,000 for the design (including revisions and drafts). Make sure you check their portfolio before you choose a designer. It also helps to have a very clear brief with the contents of your infographic as well as reference as many other infographics as possible. This helps the designer understand your design criteria. Typically you should expect to wait 7-10 days to receive your first draft and then 1-2 days for each revision thereafter. This lesson will explain how Google applies different weights to backlinks and how you can measure the quality of links in your link building campaign. Why is the Quality of Backlinks Important? As covered in our earlier lesson on link building, backlinks are one of the most important ranking factors in SEO, however not all links are treated equally. Rather than just calculate the quantity of links pointing to a webpage, Google also takes into account the authority, relevance, position and editorial nature of those links. The most important thing when analyzing link prospects is that bad links can hurt your SEO. SEO is meant to be a natural, organic process and Google penalizes websites that violate their Webmaster Guidelines with paid, manipulated or low quality links. You can use the processes on this page in order to avoid accidentally building low quality or spammy links to your site. The most important factor for determining the quality of the link is the link authority of the website’s homepage and linking page. As covered in our article describing how Page Rank works, the Page Rank model is based on link equity and link flow. The higher the authority of the website’s homepage and linking page, the more valuable the link. The easiest way to calculate the authority of the homepage and linking page is by using Moz.com’s OpenSiteExplorer.org tool, which shows the respective Domain Authority (DA) and Page Authority (PA), scored out of 100, for a given URL. The higher both of these numbers are, the more valuable the link is. As you can see below, SEOBook.com has a DA of 84 and a PA of 86 (very high). MajesticSEO.com has another tool called “Trust Flow” and “Citation Flow”, which also aims to measure the link authority of a URL. The former is based on the number of “trusted” domains pointing to the website while the latter is based on the number of citations to the brand’s homepage. Essentially, the higher both of these numbers, the more valuable a link from that site will be. Personally, I prefer to use the DA/PA metrics above rather then Majestic’s, however they can both be used together for greater accuracy. Finally, many SEO agencies also use the Page Rank Toolbar to calculate the authority of a webpage when ascertaining the value of a link from it. However, Toolbar Page Rank has become increasingly unreliable in the last 2 years and less frequently updated. In addition to measuring the authority of websites, Google must also be able to understand the relevance and topical nature of a specific website or page. This is because as part of the search process, Google must not only deliver high quality results but also relevant results for the user’s query. One of the primary methods Google uses to understand the topical relevance of a webpage is through its backlinks and the anchor text of those backlinks. Getting backlinks from relevant websites or pages that closely match the subject your website will help a lot in ranking for your keywords. For example, if you run a dog training website that has links from other dog training websites, blogs and pet owners, then this would be more valuable than links from off-topic articles such as football news, sports and economic affairs. While link authority is still very important in SEO, Google has got much better at analyzing the on-page quality of a website, which includes its design, content quality, brand signals and overall user experience. In fact, all of these factors made up parts of the Panda algorithm, which was rolled into Google’s core search algorithm in 2013. This illustrates just how important Google views all of these factors in SEO. As such, when deciding whether you want to receive a link from a site, you should scrutinize the overall quality of the site’s content, whether they have strong brand and social signals, and the overall look and feel of the site. If it’s high quality with excellent content, it’s likely to be a very valuable site to receive a link from. In contrast, if the content is low quality, spun content or lacking in value, you should think twice about getting a link from that site. Following on from the above, Google has also began to add more weight to pages or articles with greater editorial control or that are updated more frequently. This is because pages that are updated more frequently are likely to have greater editorial control and value, which is what backlinks were originally designed to measure. Pages that regularly receive new links or comments help to keep the page fresh (as Google sees that the content of the page changes), therefore links from such pages will be more valuable. Google’s original Page Rank algorithm was designed to attribute weighting to backlinks in order to rank websites. As part of this formula, links that were higher up the page and more likely to be clicked would pass more link value than the others. In the following video, although Matt Cutts (head of Google’s Search Team) explains that the order of links on a page isn’t important for SEO, he also backtracks on this statement by saying he wouldn’t make the most important link the 1001th on the page. We also now know that if you have two links pointing to the same URL on a webpage, Google will only “count” the anchor text of the first link on the page. In January 2014, Matt Cutts also warned SEOs against the practice of guest blogging. This could mean that backlinks in the author profile at the bottom of a page may pass even less value than before, as predicted by this article 12 months earlier. The Page Rank algorithm works by calculating the link authority and link equity of a specific webpage. This can informally be called “link flow”. The more external links you have on a page, the more diluted the link flow becomes and the less weight will be passed through your link. Therefore, backlinks from pages with fewer external links will pass more authority than pages with dozens or 100s of external links (e.g. directories). This article provides an introduction into SEO competitive research and how to build backlinks by analyzing your competition. What is Competitive SEO Research? The process of analysing your competitions backlink profile as part of SEO is called “SEO competition research“. The following lesson contains a background to competitive SEO research, why it is important, how to research your competition using tools and how to use competition research to build backlinks for SEO. Why is it Important to Analyze your Competition when Planning an SEO Campaign? Before you begin your SEO campaign, it’s important that you first analyze the existing competition for your keywords and campaign. This is because in most cases, you’ll not only need to outrank your existing competition (zero-sum game) but also be able to prepare and plan a strategy for how to do so. This includes the use of resources, budget and time management. For example, ranking a local business in a small town or city where there is low competition is likely to be a much easier job than getting a large business to rank for an international keyword with 1,000s of competitors. For a small local business, a local SEO campaign may show results within 1-3 months. However, for a medium or larger size business it may take 6-12 months before you see positive results. This is because it takes time to build links, webpages and content to match that of your biggest competitors. There are a number of different tools or strategies for analyzing the competition for your keywords or industry. If you’re using the OSE Tool, the most important metrics that matter are the respective DA (Domain Authority) and PA (Page Authority) scores. These metrics take into account the authority of a website based on the quality and number of backlinks pointing to the site. The metrics are designed to closely mirror that of Google’s Page Rank algorithm, which is the main method used by Google to rank sites. In layman terms, the higher the DA and PA score, the higher the competition and the more likely the site will rank higher in Google’s search engines. Additional tools that you can use include the Google’s Adwords Tool (which displays the competition as Low, Medium or High); or you can use the Google Page Rank Toolbar. If using the latter, anything with a Page Rank of PR3 or higher can be viewed as quite competitive, where as PR0 – PR2 is reasonably low. Just note that the Page Rank Toolbar is only updated a few times per year therefore the data is not going to be particularly fresh. When you’re using Ahrefs.com or other backlink checker tools, you won’t be shown a DA or PA score. However you can look at the total number of root domain backlinks to the site as a measurement of the site’s authority (in order to do this, click on Referring > Domains > DoFollow). You can also see if the site has any strong government or education backlinks, which are more important than regular backlinks. Once you’ve analyzed your competitors (let’s say the first 10 results on the 1st page), it should give you some indication of the level of competition and resources required to outrank them. Essentially, the main thing that you’re looking for is the number of root domain backlinks pointing to the website’s homepage and the individual page itself. For example, let’s use the keyword “SEO training” in the UK. The Domain Authority (DA) of the first 5 results in Google UK according to Mozbar varies from DA25 (4th) to DA66 (1st). The Page Authority (PA) itself ranges from PA23 (3rd) to PA49 (1st). The no.1 result (WebCredible.co.uk) only has around 2 external links directly to the page, however the DA is very high and will be the main reason why this individual page ranks no.1 for the keyword “SEO training”. Based on this information, I think it’s possible that we can rank first page for this keyword since sites such as the LondonWebFactory.com rank 4th with a DA of only 25 and 14 root domains (RDs). This is a very low number of root domain links and could easily be achieved within the space of 1-3 months. If we wanted to rank no.1 for this term, then we’d probably need to build more than 2,000 links to our homepage in order to compete with WebCredible (2,156 Root Domain Links), which would probably take more than a year. You can also your competitor’s backlinks report information in order to find and copy your competitor’s backlinks. For example, if you’ve seen they’ve got links listed on other directory pages and articles then you can contact those sites and try to get your website listed as well. Analysing your competitor’s backlinks and where they come from also allows you to understand their strategy and copy it on your own site. For example, if you’ve seen a specific educational resources or tool that they developed received 100s of backlinks then you can try developing an even better tool or resource and copy their approach. Essentially, analysing your competitors backlinks lets you view their most important pages and what type of strategies “work” in your industry. The OSE tool above even does this for you by showing you the pages with the most backlinks on a site. This can be found under “Top Pages” in the menu. The number and quality of backlinks to a site have been by far the most important ranking signal for Google in the past. However, in the last 1-2 years, it appears Google has given less weight to the number of backlinks and more weight towards on-page factors such as User Experience (UX), Content Quality, Brand Signals and Page Speed. As part of the link building process, it’s important to accurately monitor and analyze the number of backlinks pointing to your site. Otherwise, how else would you keep track of your SEO campaign? In this article, we’ll provide a list of the top backlink monitoring tools on the Internet. We’ll provide information and screenshots besides each tool as well as discuss the pricing options and features. Ahrefs.com is the no.1 backlink checker tool that you’ll find online. It’s also the same tool that I use for all of my SEO campaigns. Although pricey (the cheapest premium version costs $79 per month), Ahrefs.com has a very simple user interface that allows you to see all backlinks to a URL. You can easily filter links by dofollow, date found, new links, lost links, government links, educational links, referring IPs and more. Like most backlink checker tools, Ahrefs.com gives users the option to export their list via CSV. This includes a maximum export of 2,500 results. In addition to a backlink checker, Ahrefs.com has other useful features such as SEO reports and a Mentions Trackers. OpenSiteExplorer.org (OSE) is powered by Moz.com and is another great tool that is very popular with SEOs. This tool is free to use when running backlink reports on the free version (up to 2,500 rows). You can filter the backlinks by dofollow, top pages, linking domains, anchor text and more. They also recently added a new feature called Just Discovered, which lets you discover brand new links to your domain faster than any other tool (this is great for immediate reporting such as PR). The best feature of OSE is that it measures and assigns value to different webpages based on Domain Authority (DA) and Page Authority (PA). This is one of the only tools on the internet that actually analyzes the link authority of a website or individual page in real time since the Google Page Rank Toolbar became updated less frequently. You can also install the Mozbar extension for Chrome in order to quickly to view DA and PA values when doing competition analysis. The only thing I don’t like about OSE however it that is has a less intuitive user interface then Ahrefs.com. You have to go through more steps and click more buttons to filter the backlinks, plus it takes a little longer to load. If you upgrade to the premium version (Moz Pro) for $99/month than you’ll also get access to Moz Analytics Campaigns and the ability to track up to 300 keywords. This is great for getting starting on new SEO campaigns and it also analyses other factors such as brand mentions and social signals. This all helps to record the success of an inbound marketing campaign. Google Webmaster Tools is provided by Google for free. All you have to do is sign in and register your website, then you’ll find the links report under Search Traffic > Links to Your Site > Download Latest Links. Although Google Webmaster Tools is essential for every webmaster (it alerts you to errors and penalties on your site, as well as lets you submit a site map), it’s backlink reports are pretty poor. The problem with Webmaster Tools’ backlinks reports is that you only have three options: domains that link to you, entire list of latest links or your top linking anchors. It’s impossible to filter the links based on other important dimensions such as link authority, dofollow, site-wide links, educational links, referring IPs or lost links etc. Part of the reason for the poor backlink reporting is that Google doesn’t want to give away too much information to webmasters about their own backlinks. For example, if Google provided a full list of backlinks to your site in order of trust and authority than it would be compromise their secret SEO algorithms. Therefore, you’re better off using one of the other options above. Majestic SEO is the final backlink checker tool that we can recommend to users. Upon analyzing a URL, users can view the backlink report, site explorer and see the citation/trust flow of each site. The report also includes useful charts and graphs for new backlinks over time and a breakdown of your top pages based on trust flow and citation flow. Trust flow is calculated by the number of links from a seed set of trusted sites (similar to how Page Rank works), while citation flow is based on the number of citations given to a URL or site. Personally, I don’t see a need to upgrade to the premium account as the basic backlink reporting tools are available for free. The only advantage of a premium account is if you need more than 2,500 site explorer rows. What are the Most Important Features in a Backlink Reporting Tool? Out of all of the main SEO ranking factors, backlinks are by far the biggest factor to help your website rank in Google. As covered in that article, backlinks to your sites homepage and individual page still make up around 41% of SEO rankings in 2014. This lesson will explain the history and strategies behind link building as well as the different types of penalties from Google that can result from the wrong way of link building. For a long time now, backlinks (external links towards your site) have been the most important search engine ranking factor used for websites. For example, we mentioned in our previous article how backlinks made up around 66% (two-thirds) of Google’s algorithm for ranking websites in 2009. Although the weighting of backlinks in the SEO algorithm is decreasing, it still makes up a huge proportion and is therefore something you should focus on in any SEO campaign. There are a number of strategies that webmasters can use for building backlinks to a site. Because there are so many different strategies that you can use, we’ve decided to list them all here with more detailed lesson plans about each one. We’ve listed the following link building strategies from the most popular and easiest down to more niche types of link building. Please note that there are far more link building strategies available (as seen on this PointBlankSEO.com page), however many of these are not suitable for beginners and may take you several weeks to learn. Not all links have the same value. Search engines such as Google measure links using different factors such as the authority of the site (e.g. a link from BBC News would have far more weight than a small blog), the relevance of the site and the authority of the page that the link is from. Essentially, Google uses a system of link authority and equity. A link from a page that has lots of backlinks will carry more authority or “page rank” then a link from a page with little or no backlinks. A page with multiple links will also dilute the link equity of the page. You can learn more about link equity and measuring the value of links in our lesson on Page Rank here, however suffice to say your aim should be to get links from sites with high authority or page rank. It used to be the case that all links on the Internet passed value. However, because of the amount of links that spammers built from blog comments and directories, in 2005 Google launched a new link value called “nofollow”. NoFollow is a value that can be inserted into the rel attribute of a HTML link element in order to prevent it from passing value in the search engines. The purpose of the nofollow link is to remove the link value or “noise” from 3rd party spammy blog comment links or links that are advertorial in nature. Virtually all blog comments and social media links are now set to nofollow automatically. This makes them much less valuable than regular dofollow links, which do pass value, and are found within the main content itself. You can learn more about nofollow links or when links should be set to nofollow in Google’s Webmaster Guidelineshere. As part of the link building process, you’ll want to build links to your most popular pages in addition to your homepage. This is because while building links to your homepage helps build your sites overall authority, backlinks to individual pages also help those to individual rank for their primary keywords. The anchor text of the backlink is another huge signal that Google uses in determining the topical relevance of your page. The anchor text is the clickable text used within the link. For example, the anchor text in the link Wikiweb marketingis “Wikiweb marketing”. It used to be the case that SEOs would build links with their primary keyword in the anchor text as often as possible. For example, if they had a website selling bikes then 70% of their total anchors in their links might be “bike shop”. However, Google reacted to this type of over optimization in 2012 by creating penalties for sites that over optimize their backlinks, therefore you’re better off keeping the anchor text as natural as possible. As part of link building, it’s also important to keep track of the inbound links to your site and analyze your campaign. In order to track the links to your site, we recommend using a tool such as OpenSiteExplorer.org (free version), Majestic SEO (free version) or Ahrefs.com (paid version – around $75/month). These tools let you add your URL and then view all backlinks to your site. As we explained in the previous lesson on On-Page SEO, the content and articles of your site (including page titles, h1 tags and keywords) plays a huge part in helping your website rank for keywords in search engines. Why is It Important to Plan a Content Strategy? Because the content of your site has such a significant impact on bringing you the right SEO traffic, it’s important that when you launch an SEO campaign that you plan a content strategy accordingly. The other reason why a good content strategy is so important is because long-tail keyword traffic makes up 70% of all searches on the Internet. A website with an abundance of well written content, such as a blog or news category, will help your website rank for more long-tail keywords and thus generate more traffic from SEO. In recent years, Google has also launched new algorithms, such as Panda in 2011, that aim to promote good content on the Internet and relegate sites with poor quality, re-hashed or spun content. It’s therefore very important to invest in high quality content that provides unique value to end-users and doesn’t just serve to help rank for long-tail keywords in the search engines. Hint: If you want to know where to find high quality writers to publish content for your site then we recommend reading our article on hiring writers for your website. In this article, we’re mainly focused on planning content for the sake of SEO. The main point of publishing content for SEO purposes is to create articles and pages that will drive maximum short-tail and long-tail keywords from search engines. As such, you’ll want to find a list of keywords to tailor your content around. In order to help you find a list of content topics and ideas, we recommend using keyword research tools such as the Adwords keyword tool. Run a search for your primary keywords or business (such as false eyelashes, gold bullion store, Sheffield photography) and you’ll see a list of relevant, high traffic keywords that people search for. You can then look at the high traffic keywords and use them as content ideas for your site. For example, let’s say you run a photography business in London, UK. You can search for “photographer” and limit the geographic target to London. We can see that terms such as “wedding photographer”, “London photographer”, “portrait photographer”, “professional photographer” and “fashion photographers” are some of the highest searched for keywords. You can then use this information to plan dedicated service pages for each of these terms. For example, you’ll create a webpage with the title “Wedding Photographer” and add unique, helpful content that explains your services and uses those keywords. You should also do the same thing for the other keywords such as “Portrait Photographer” and “Professional Photographer”. When writing these pages, you should follow the On-page SEO guidelines that we wrote about in the previous lesson. In addition to the Google Adwords tool above, there a number of other useful tools on the Internet for planning your content topics. The downside to relying solely on the Adwords tool is also that it only shows information for short-tail keywords as opposed to long-tail keywords and topical ideas. SEMRush – This tool is great for analyzing your competitors organic keyword rankings and then copying them. Researching your Competition – Take a look at your biggest competitors sites and see which are their most popular keywords or pages and copy them. Buzzsumo.com – This is a social analytics tool that helps find the most widely shared articles and pages for a specific keyword. Although not built for SEO purposes, it’s a great tool for finding topical content that people find interesting. Depending on the size and nature of your website, you might want to plan all of your content topics in a pyramid tree structure before publishing them on the site. This will help you organize content topics into logical hierarchies and categories before publishing on your site. For example, a large eLearning websites such as Tradimo.com will have spent months planning their content tree into articles, lessons, modules and courses before launching their site. This helps to their content more presentable and easier to navigate for users. On the other hand, an ecommerce site will probably not have to focus on planning such an elaborate content tree for its site. Its main focus would be preparing product categories and collections with a blog to keep it updated. When publishing your site, you should add relevant categories and tags for your articles in order to make them easier to find. You should also make sure you inter-link content for user experience and SEO, and that you structure your website’s menu so that each page can be navigated to in 3 clicks or less from the homepage. In conclusion, this lesson has taught you the importance of keyword research and content planning, how to find keyword ideas for your content, and useful tools for keyword research. The next article will now discuss how to hire content writers and bloggers for your site. Keyword research is about finding the right type of keywords that you want your website to rank for in the search engines. Keyword research is the most important place to start before beginning your SEO campaign. Optimizing you website for the wrong keywords will set you on an inevitable collision path with failure. For example, if you run a local dental practice in London then it’s likely that your target customers will be searching for keywords such as “local dentist”, “London dentist” and “dental surgery in London”. Optimizing your site for these types of terms will help your site bring in targeted traffic, leads and new customers on a monthly basis. The more relevant and targeted your chosen keywords, the higher the conversion rate for your site. However, certain keywords will be searched for more than others. That’s why it’s important to not only optimize yourself for relevant keywords, but also high volume keywords too. There are a number of free keyword tools that help you measure and find the most relevant, high volume keyword search terms on the Internet. The best place to start is the Google Adwords Keyword Planner Tool (free). In order to use this tool, you’ll need to set up an Adwords account. This is free and should only take a few minutes to do. (Previously the Adwords tool was available without having to sign into your account, however Google made changes to this step in 2013). 2. Input a few of your target keywords. In our example we’ve used “false eyelashes”. Then click “Get Ideas”. 3. Use the targeting tool on the left-hand side to narrow down your geographic target. For example, if you only sell products within the UK then you should limit your targeting to UK-only. The figures in the keyword tool will automatically reflect this. You’ll now be presented with a table that shows the monthly search traffic volume for those exact keywords. As you can see in the picture above for example, “false eyelashes” receives exactly 6,600 searches per month in the UK. When you scroll down, the Adwords planner also shows a list of relevant keywords with their monthly search volume. Using the keyword tool above, you should be able to find a list of highly targeted; high traffic keywords to start your SEO campaign for. The volume of traffic for different keywords will vary massively depending on the popularity of the industry, niche and keyword. Don’t assume just because the keyword search “false eyelashes” gets 6,600 searches per month that it’s more valuable to optimize your site for this then “best false eyelashes”, which only receives 1,300 searches per month. This is because bigger keywords also have more competition in the search engine rankings results (SERPs), which makes it harder to rank for this term. This means it may be more beneficial to target lower volume keywords with less competition. For more information about choosing keywords with lower competition, read our lesson on competition analysis here. When doing keyword research there are two types of keywords: short-tail and long-tail keywords. Short-tail keywords are exact-match keywords such as “shoes” or “buy shoes”. 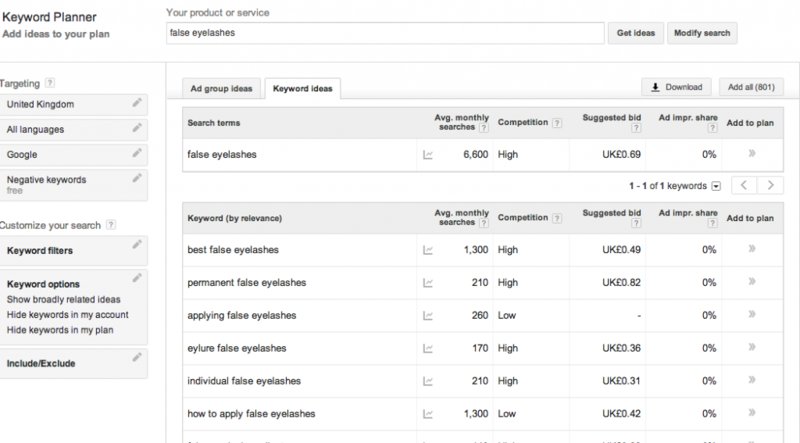 This is what the Keyword Planner tool display. Long-tail keywords are broad searches that include multiple keywords in the search. E.g. “cheapest shoes in London”, “blue shoes with white laces” or “blue puma shoes size 8”. Although individual short-tail keywords receive lots of traffic, short-tail keywords actually only make up 30% of searches on the Internet. The rest are comprised of unique, long-tail keywords. In fact, according to Google, 15% of the keywords they see everyday have never been searched before! Long-tail keywords also have a higher conversion rate and value then compared to short-tail keywords, as they usually involve more specific queries where the user is at the buying phase of the cycle. For example, someone searching a short-tail keyword such as “shoes” is usually only at the research and browsing stage. However, someone that searches “red puma shoes size 8” is more likely to be at the buying stage as he/she knows exactly what they want and are looking to now buy it. Rather then starting your keyword research from scratch, there are a number of tools that also show you your competitor’s main keywords and rankings. The best keyword tool for competitive analysis is SEMRush.com (free). All you have to do is enter your competitor’s URL in the search bar and then you can see all of your competitors most important organic/advertising keywords. For more information about how to use SEMRush we recommend reading our SEMRush review here. We’ll now look at how to optimize our website for our chosen keywords in the next article here. Internal link architecture is a key on-page factor in SEO. In this lesson, we’ll show you how to optimize your site’s internal link structure and how this can improve user experience and page views. Internal links are links that point internally to other pages or sections of your website. This is in contrast to external links, which are links from external domains. For example, this link is an internal link as it points to another page on WikiWeb.com. One of the most common misconceptions in SEO is that internal links carry little weight in comparison to external links when ranking web pages. The fact is however that internal links on a large, authority site can carry a huge amount of weight. It’s also thought that Google has a “big site” algorithm, which means pages on larger sites rank higher than on smaller sites. This is because of greater perceived authority and greater internal link flow to those pages. Why are Internal Links Important for SEO? Your internal link structure is important because links are one of the most important factors that search engines such as Google use to rank and order websites. Internal links helps improve your link flow or “Page Rank” to individual pages on our site, helping them to rank better. The anchor text of links (as explained in this lesson) helps Google to understand the context of a webpage and to rank better. Internal links also improve user experience. A lack of internal links means that it will be more difficult for Google to crawl and index deeper sections of your website. It will also be harder for users to explore different areas of your site. A good example (albeit a little over the top) of an internal link structure is Wikipedia.com. You can see that they internally link important keywords in all of their articles to specific pages on their site. This massively improves user experience, page views and SEO. There are a number of things you should do to improve the internal link architecture of your site. A well-known rule in SEO is that no page on your site should be more than 3 clicks away from the homepage. This might include navigational links in the menu, footer, homepage or body of your articles. If you can aim for this than your internal SEO structure should be on the right tracks. You should aim to use relevant, useful anchor text when linking internally. Look what I did in the previous sentence for example. By using relevant keywords to link to your inner pages, you’ll help those pages rank better in SEO. A useful WordPress plugin that you can use is SEO Smart Internal Links. This tool automatically hyperlinks keywords other internal pages on your site. You can customize it to only link specific keywords, phrase and URLs, as well as make sure it only adds one link per page. The downside to using automated tools for internal linking purposes is that it doesn’t look quite as natural as when an editor links to other pages in an article. If used incorrectly (for instance, linking every occurrence of a word on a page), it can also lead to horrible consequences and poor user experience. According to this by Matt Cutts, you don’t need to worry about over-optimized internal linking causing penalties on your site. Your homepage is typically the most linked page on your website; this means is has the highest Page Rank or link authority. You can take advantage of this by adding links on your homepage to the most important pages on your site. This helps channel some of that link flow or Page Rank to your inner pages in order to help them rank better. Breadcrumbs are a navigational feature that reveals the users location on a website (the name is derived from the tale of Hansel and Gretel). In addition to helping the user keep track of their location on a site, they also massively improve the internal link structure of your site. Many themes have the breadcrumbs feature as default, however if your theme doesn’t offer this then there are a number of WordPress plugins you can install such as this one. In addition to having important links in your main menu, navigational links in your footer and sidebar can also improve user experience and SEO. Take a look at the Hotels.com footer below for example. If a user enjoyed reading an article then it’s likely they’ll read another article on a similar topic. From my own experience, this Related Posts Plugin increased page views by 5% on one of my sites. Remember that all of these user signals may be used by Google to rank your website. Both these plugins will also once again improve the internal linking structure on your site, which is great for SEO. The Widget Context plugin allows you to display different widgets or links in your sidebar depending on what your user is reading. For example, if someone is reading an article about SEO then you show him or her custom links for your SEO Training Course in the sidebar. Likewise, if they’re reading about PPC or PR then you can link them to your other PPC or PR lessons. The advantage of using the widget context plugin is that it allows you to show different widgets depending on the category, page or post type. This allows you to show more relevant links to users in order to improve user experience and conversions. Many of the biggest ecommerce sites (such as Amazon.com below) implement a similar technique of showing products or deals you might be interested in based on your previous purchases, product category or account history. You can also witness this in the Related Videos sidebar on Youtube.com. Remember that links towards the top of the page are treated more importantly by Google because users are more likely to click on them. As such, remember to link important keywords or phrases in the first few paragraphs of your content as opposed to the bottom of your content.